BLUE DEVIL WEEK continues here at Once Upon a Geek! Today we’ll be spotlighting places Blue Devil has turned up outside of comic books. Don’t forget, on Friday we’ll feature an exclusive ONCE UPON A GEEK interview with the creators of Blue Devil! 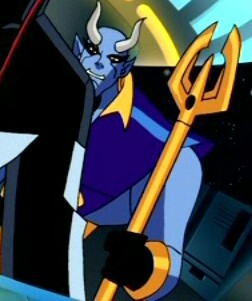 Blue Devil made a few cameos in the Justice League Unlimited animated series, including the episode “Dark Heart” in which he had a non-speaking appearance along with most of the league. He had a line in the episode “Destroyer” in which he yelled for everyone to get to the Javelins. Those minor appearances led Blue Devil to a lead role in the comic book Justice League Unlimited #25. In that issue, Blue Devil struggled with his role as a hero because the people he rescued were frightened by his appearance. 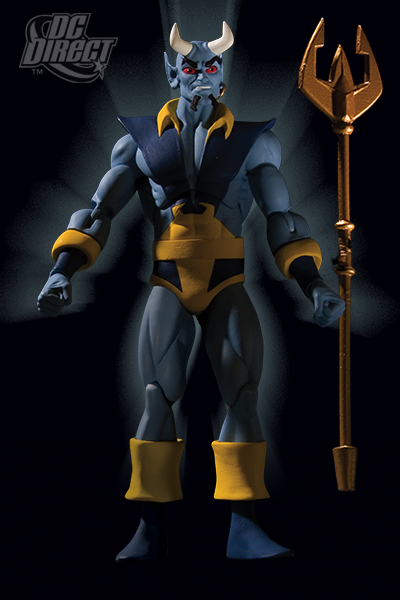 The first Blue Devil action figure was produced as part of the Justice League Unlimited toy line in 2007 (seen below). This figure is 4.5 inches tall (5 inches if you count the horns). While he doesn’t look exactly like a Paris Cullins drawing, it’s a pretty good representation of the original Blue Devil design (admittedly with an “animated series” look to him). You’ve got the trident, the goatee, the earring, the pointy ears, the flared shoulders and collar, the blue and yellow colors look great, and the devil design around the belt is there. The horns aren’t exactly right and he’s got a tail for some reason, however, those can be overlooked. I was just happy to see a Blue Devil figure produced! There is another Blue Devil figure due out July 22, 2009 from DC Direct (see below). This figure will stand 6.5 inches tall and is patterned from George Perez’s drawings in the classic 1986 History of the DC Universe comic book. I’m not entirely thrilled with the face on this prototype figure. My hope is that the final figure’s face will look slightly more like the comic character. Believe it or not, Kenner was developing Blue Devil and Shockwave action figures slated for the Super Powers collection back in the mid-1980s. Unfortunately, the line was canceled before these figures could be produced. You can read all about it, see presentation artwork, and mock-up figures by clicking here. 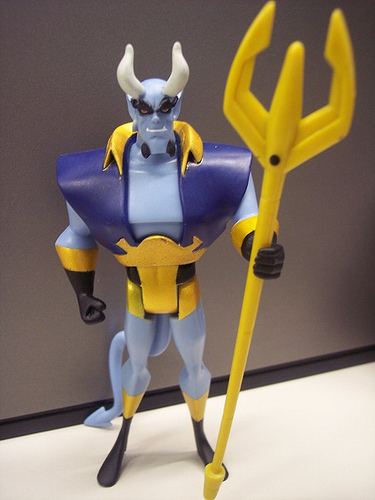 For information specific to the unproduced Blue Devil figure click here. For information specific to the unproduced Shockwave figure click here. You really gotta check out those unproduced Super Powers figures. They look so friggin’ cool! I would’ve loved these figures as a child. 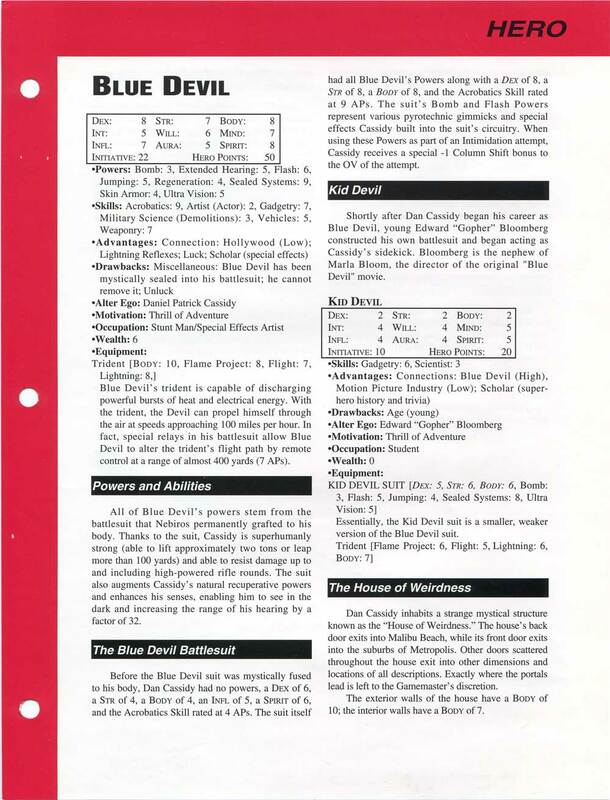 It also goes to show how popular Blue Devil was during the mid-1980s. 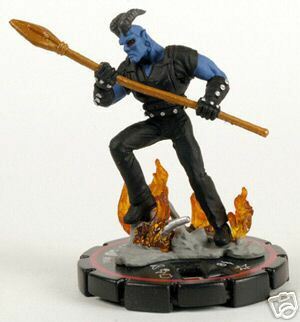 Here is a Blue Devil HeroClix game piece from WizKids. HeroClix is a collectible miniatures game in which players construct teams of heroes and villains to play out a battle turn-by-turn on a grid map. Blue Devil came in three different ranks: Rookie #43, Experienced #44, and Veteran #45 (shown here). While the Blue Devil figure looks the same for each rank, the Rookie and Experienced feature Blue Devil on an elevated plane (to represent the use of his trident when flying). The Blue Devil HeroClix are from the “Collateral Damage” set produced in 2006. The Rookie and Experienced ranks are considered to be “uncommon”, while the Veteran rank is considered to be “rare” (meaning somewhat difficult for collectors to obtain). The Rookie is worth 50 points, the Experienced is worth 76 points, and the Rare is worth 100 points (showing that Blue Devil became more powerful later in his career). If all that is meaningless to you, don’t worry. The cool thing is they made a Blue Devil game piece and used his costume from Shadowpact. I love the trident and the flames! 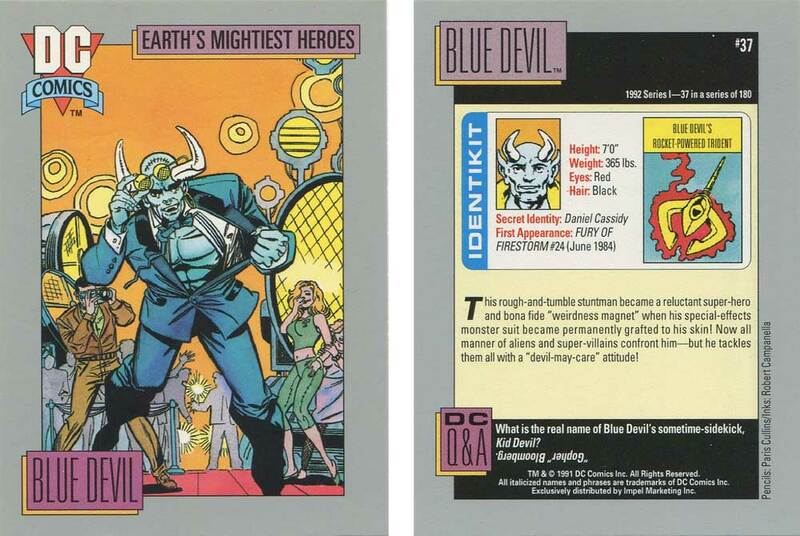 There were two Blue Devil cards from the “VS System” collectible card game produced by Upper Deck. In the game, players build and play a deck of VS System cards in an attempt to win a game against their opponent. 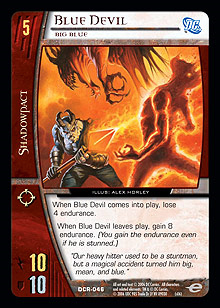 The first card is “Blue Devil: Dan Cassidy” and is #DCR-045 from the “Infinite Crisis” set produced in 2006. His attack rating is 4, his defensive rating is 2, and he has a casting cost of 2. When activated you lose 4 endurance, however, when Blue Devil leaves play you gain 6 endurance. The quote on the card is, “Lately, all Big Blue does with his powers is throw drunks like me out of the Oblivion.” Phil Noto did the art. 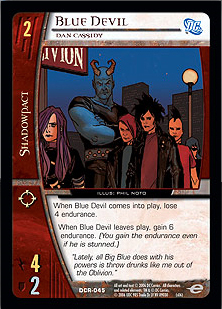 The second card is “Blue Devil: Big Blue” and is #DCR-046 from the same set. His attack rating is 10, his defensive rating is 10, and he has a casting cost of 5. When activated you lose 4 endurance, however, when Blue Devil leaves play you gain 8 endurance. The quote on the card is, “Our heavy hitter used to be a stuntman, but a magical accident turned him big, mean, and blue.” Great art by Alex Horley! Now, if all the attack, defense, and casting cost jargon is meaningless, don’t sweat it. Just be happy they included Blue Devil in this popular card game. 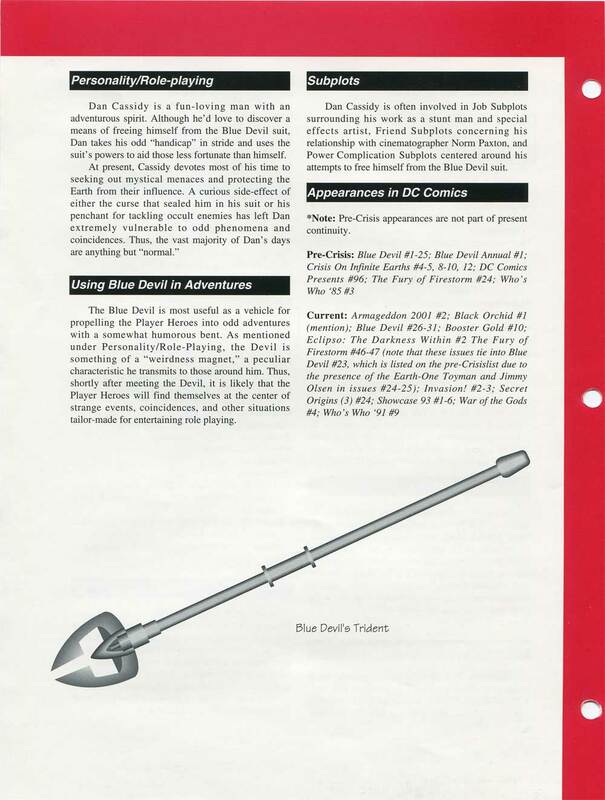 Role-playing statistics for Blue Devil were published by Mayfair Games in 1993 for the DC Universe Who’s Who Volume 3 role-playing companion. Mayfair’s supplements featured role-playing statistics for each character, tips to role-playing the character (such as personality and subplots), and a complete list of comic book appearances for the character. These were designed as companion pieces to DC’s Who’s Who loose-leaf edition published around the same time. Below you will find the front-side and back-side of the Mayfair Who’s Who Blue Devil entry. If you are interested in reading the text, click the image for a larger version. This final Blue Devil piece comes from the 1991/1992 DC Comics trading card set produced by Impel Marketing. Blue Devil is #37 in the series and the art was done by artists Paris Cullins and Robert Campanella. If you are interested in reading the text, click the image for a larger version. That’ll do it for Blue Devil appearances outside of the comics. Be sure to come back tomorrow where we’ll look at some favorite Blue Devil covers. Also, don’t forget that on Friday we’ll have the very first ONCE UPON A GEEK creator interview featuring Dan Mishkin & Gary Cohn! Great stuff, and thanks for pulling all this together. I had no idea about the 80’s action figure plan, but I’m reading up on it now. Oh yeah, I forgot to mention that BD had another appearance in an episode of JLU where he was shown walking in the background during a scene up in the space station. I knew that BD was slated for the third Super Powers wave, but I had no idea about Shockwave! I just realized one of the things that’s “wrong” about the DC Direct Action Figure above…it’s his red eyes. BD never had red eyes in the original series, and it doesn’t look like he does in the new “shadowpact” version either. So where did they get that from? If I remember correctly, the Blue Devil suit was able to turn the eyes red. Danny used the effect when they were filming the Blue Devil movie in issue #1. Again, that’s if my memory is correct. Your memory is better than mine, so I’ll defer on that point…but it’s interesting that most/all of the images we see in the covers have him with the more normal-looking white part…er, “scalera” (I had to look it up). They should’ve opted for that in the figure in my opinion. My pal Bebert actually played Blue Devil when he guest-starred in our DCHeroes game last year. A performance certainly on par with the level of entertainment we’ve come to expect from Blue Devil. Brian – I agree about the eyes should have been white. Let’s keep our fingers crossed. The image we’ve seen was just a prototype. Maybe they’ve wised up.